Everyone has their significant others or their dogs on their phone lock screens. Who’s to say we can’t have them on our Gmail theme, too? It’s time we were able to customize every theme possible. WordPress themes, our phone backgrounds, our lives… Jokes aside, customizing your Gmail theme is one way to make you want to spend more time in your inbox. In addition, it’s a good way to distinguish your Gmail accounts when you are managing several of them in Shift. Whether you want beautiful scenery as a background, your own face, or even a stock photo of a woman laughing alone eating salad – you can have it. The choice is yours! We’re just about to tell you how to do it. If you’re not yet ready to commit to one Ariana Grande and Pete Davidson (thank u, next) wallpaper, you can use one of the themes that Gmail already has preloaded. 4. Pick your theme – whether you want a caterpillar or plain blue, you can have it. On the other hand, using your personal photo to use as a theme is equally as simple to do. First, you need to upload your chosen photo to Google Photos. Once the photo has uploaded, you can go about applying it to your Gmail theme. We told you it was easy, didn’t we? 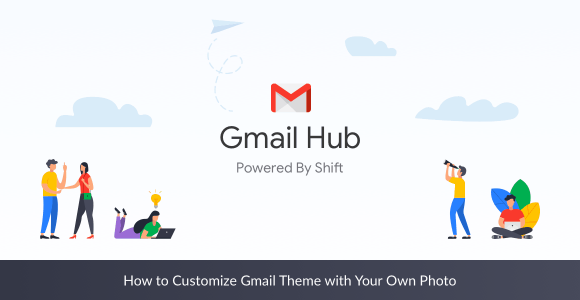 Don’t forget that you can set each of your Gmail accounts in Shift to a different theme. Time to search through your favorite photos!